A clean Ganga by 2016 — will Uttarakhand do its bit? Dehra Dun : Cleaning of the Ganga will be done before the Ardh Kumbh that falls in Haridwar in 2016. Though incredible as it may seem, this is the assurance that the union water resources minister Uma Bharati, is reported to have given to the Uttarakhand government during her recent visit to this small hill state. Admitting that this was a Herculean task before the state and central governments, she pointed out that it was a tragedy that a lot of untreated waste, including sewerage is dumped into the river in Uttarakhand. “It is an issue that the Uttarakhand government needs to tackle to ensure that the cleaning of the river is done on schedule”, she added. Taking advantage of the situation, Uttarakhand chief minister, Harish Rawat, was quick to put a demand of about Rs 9500 crores so that various requirements needed for a clean Ganga could be put in place in the state. However, he did not spell out how and where this money would be spent, or whether the state government had undertaken any survey exercise on the bottlenecks for a clean Ganga,. Though he hastened to add that one could not talk about a clean Ganga unless one takes into consideration Uttarakhand, from where the river originates and passes through its initial journey over north India, but what had the state done in the 14 years that it came into existence to cleanse the river, he preferred to ignore. It is a well known fact that there are over 130 townships big and small in this small hill state whose untreated sewerage is dumped into the Ganga. In some of the towns and townships in the upper reaches of the state work on the treatment plants is going on at a snail’s pace and no efforts have been made in expediting these works. Then there are number of ashrams and ‘maths’, some belonging to well known names that dot the banks of the river in Uttarakhand. Besides a large floating population of sages and hermits have their tenements along the river banks and they are known to defecate along the banks of the rivers, as a does a large number of the rural population of the villages along the river banks. The quantum of waste that is generated and dumped into the Ganga in the few kilometers from Laxman Jhula in Rishikesh to Haridwar can be determined from the fact that whereas the river water is grade A in Laxman Jhula where it enters the plains from the hills, it deteriorates and becomes grade B in Haridwar, indicating that the maximum pollution is in this stretch in Uttarakhand. While Harish Rawat made no mention of any time-bound programme under which treatment plants will be put up in the sewerage systems of the various tons and townships upstream of the Ganga to reduce the pollution in the river, he was also quiet on whether his government would come up with any legislation that would prevent the ashrams and ‘maths’ from dumping their waste directly into the river. Obviously the Ganga will not become clean if the chief minister adopts an ostrich syndrome to these complex problems that are in Uttarakhand and need to be resolved if the river is to be cleaned, as per the central government’s desire. But just by asking for huge sums of money and seeing that nothing translates at the ground level will only delay the mammoth task and frittle away a golden opportunity. Previous articleWhy Mr Modi is the real winner in the September By-Elections ! 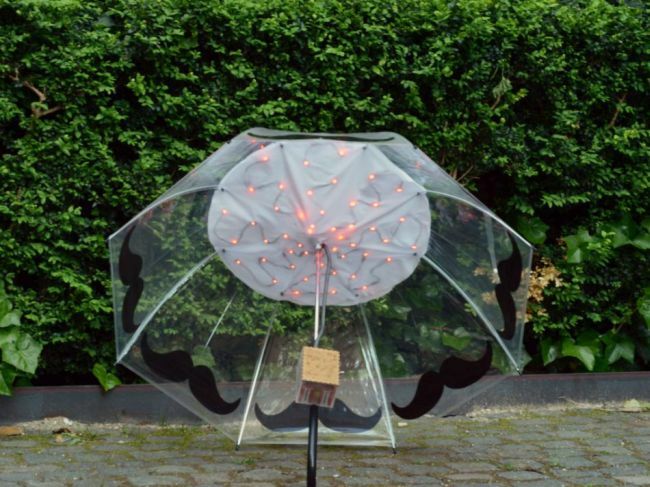 With Sensing Umbrella you can gather, display, and share air pollution data!